Carl Witwicky - Edmonton's Burial & Cremation Professionals | Trinity Funeral Home Ltd.
Carl Witwicky of Edmonton passed away peacefully on September 17, 2015 at the age of 86 years. 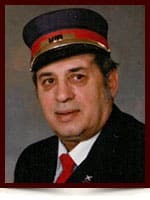 He was a dedicated worker for 37 years with the Canadian National Railroad. He will be forever remembered and missed by his loving partner of 36 years Joann Mix and her son Vincent Hallberg, Denise and grandson Marcus. Carl is survived by his children Judy, Linda, and David of Kamloops, Terry of Jasper and William of Thailand and many grandchildren; sister Esther Evans, nephew Rod (Deb), niece Rhonda (Walter); sister Shirley Smith and husband Sid, nieces Heather and Kim and sisters-in-law Dorothy and Frances. He is also loved and remembered by the dearest of neighbours and friends, Joe and Louise, Danny and Shokurat and the whole staff and many customers of the neighbouring PetroCan gas station. He was predeceased by his parents Karl and Irene; brothers Russell and Wasyl (Bill); and brother-in-law John Evans. Carl was always around to help and lend a hand to those in need, and could always be found in the garden or workshop. The family would like to thank the Home Care Nursing Team with special thanks to Suzanne (RN) and Vickie (LPN) and to the Palliative Care Unit 9Y at the Edmonton General Hospital. In keeping with Carl’s request, cremation has taken place and no services will be held. A private gathering to celebrate Carl’s life will be held at a later date. In lieu of flowers, donations can be made to the Cross Cancer Foundation or to the Salvation Army in Carl’s name.